Recently we had a handful of friends welcome new arrivals to their families. Typically, I shop baby registries when the first baby is born, since I know how nice it is to have help buying the essentials the first time around. However, when having the second (or third) child, most people are well equipped with bottles and bumbos and have made brand preferences for the other necessities. So I usually have the urge to buy something more thoughtful and unique for the new baby. Something that hopefully they don't already have, yet something the parents and baby (and siblings) will love. A special and unique baby book was something I searched high and low for when pregnant the first time around. I didn't get around to ordering Kenley's until well after she had arrived. This baby book is so cute and has adorable illustrations and envelope pockets included for keepsake mementos. I actually had the organic veggie teethers, found here, on my registry when I was pregnant with Ashlynn. I thought the idea of a baby teething on a veggie was comical (to me) and I knew they would be awesome for kitchen play later on after all the teeth broke through. A personalized story book pillow is such a cute personal keepsake. The detail on this pillow is amazing, even down to a story synopsis and 'review' on the backside, see it all here. This would be the type of gift the child would most likely hold on to their whole life. These classic wooden baby blocks are totally made over with a modern font and clean design. Educational, fun, and cute for display too. You know my love, and moreso Ashlynn's, for Babiators. She wears her's almost daily and I've actually given them away as birthday presents a handful of times this year. They are basically indestructible and come with a replacement warranty if broken... or LOST! Can't beat that! Having girls, I have a hard time finding the right gift for boys. These little buffalo check lumber jack socks are so fetch. Sorry, but seriously, how cute (and practical, too). And, since most of the recent babies are also little siblings, I like to try to include something small for big brother or sister, to help them feel special during the transition to a larger family. I actually have this book saved on one of my wishlists, but I love that you can actually personalize it. They make one for both boys and girls. Crayons and a cute coloring book are always a great go-to gift, it doesn't cost a lot, but lots of self entertainment included which is always helpful when a new mom or dad has their hands full with a fussy new baby. The little rattles are cute gift for baby, but also something fun for brother or sister to play with. My mom had bought similar rattles for Kenley last year when she was born and Ashlynn played with them more than her. And finally, another super sweet baby book. I love the vintage postal border and how you can write letters to your baby through all the milestones, events, and years ahead. 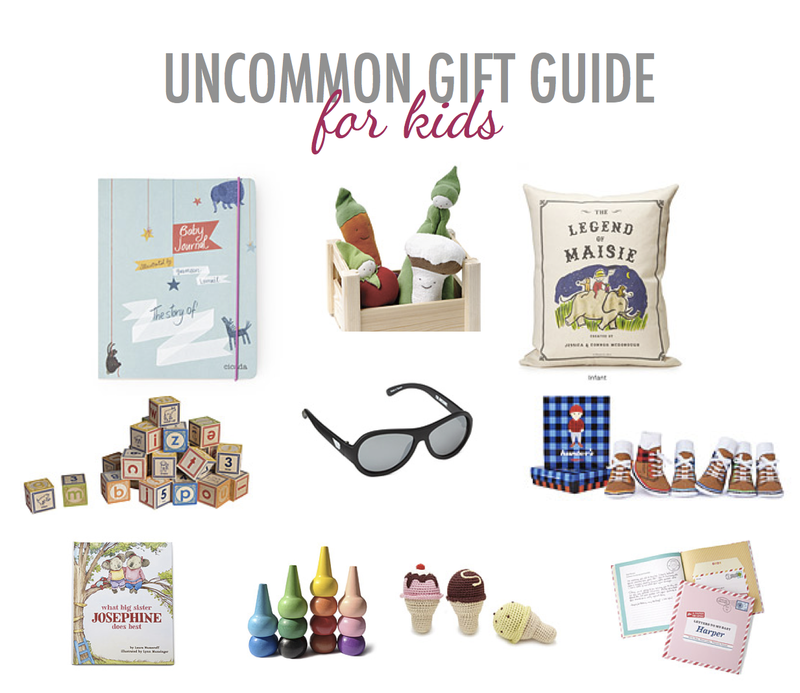 All of the items featured can be found at Uncommon Goods. Based out of Brooklyn, NY, Uncommon Goods strives to feature unique designs and handcrafted gifts created in harmony with the environment and without harm to animals. Also, $1 of your purchase is donated to a non-profit of your choice. Since starting their Better to Give program, Uncommon Goods has donated $300,000 in the past twelve years! What kinds of gifts do you like to give to additional additions? Thank you to Uncommon Goods for sponsoring this post. And thank you for supporting the companies that support this blog. Fun toys!! Cam loves those crayons, but I may have to add a few more things to my registry!! Thanks for sharing!